This time of the year is special in Coastal North Carolina. The cool air has started to settle in, and we are reminded that the winter is close as we see the water “smoke” in the mornings. This is one of my favorite seasons, I always think about my days charter fishing; chasing king mackerel for our customers and the comradery that came when you were part of the fleet. It is a time for us to reflect about the year and to give thanks for friends, family and all of the opportunities we have been given. Over the last twelve months, we have continued to see our company grow and prosper with six boats under construction and unprecedented demand in the repair yard. Our team is working hard to improve the boats we build and to ensure the customer experience here is the best in our industry – no matter how large or small the project may be. We continue to increase our offerings and are anxiously awaiting the delivery of our new 300-ton travel lift. Our boats, owners and crews have had a very successful tournament season and we are proud to see them reaching their goals as they extend their range across oceans and countries. Although we had great success in 2018, we had challenges as well. In September, our community was changed forever with the landfall of hurricane Florence. For nearly 40 hours, we experienced hurricane-force winds and as much as 36 inches of rain in some areas. We recorded the two highest tide levels in the history of our town. Thousands of trees fell during the storm, countless homes were damaged, power was lost for 11 days. Many of our buildings experienced significant damage, and we are still working to repair some of them. We had employees lose their homes, and in some cases, all that they owned. Some people might have thrown their hands up and not known where to start; But like any family, ours stepped up to the challenge. Ed Stack and his group of F3 friends set out in the community moving furniture, removing carpet, cutting trees off of homes, installing tarps and helping people to start to recover. Tate Lawrence gathered clothes and essential supplies for our fellow employees, and with the help of Chaney Brothers, delivered ice and water to the Down East Community. Dozens of others from our company did all they could to help those that were in need. 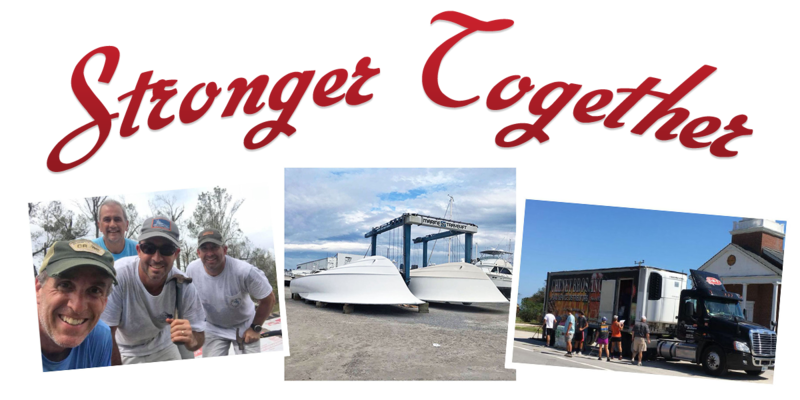 I was humbled by the calls that came from our boat owners, fellow boat builders, service customers, dealers and friends from across the country simply asking, “how can we help?”. A lot of people gave of themselves to help, and I am grateful for them all – but one story really stands out. A longtime customer and very close friend called and asked how he could help. After some discussion, he sent hundreds of new shirts for us to distribute, but I sensed that wasn’t all he had planned. A few days later, I received a box from him and inside was a check for each individual employee of our company and a letter making it clear that while he and his boats’ crews’ thoughts and concerns for each individual was great, they hoped that this gesture would encourage our Jarrett Bay family to know that we were not alone. It did so much more, it restored their faith in others, it encouraged some with no damage to pass along the check to those more in need and reminded us that we can all make a positive impact for others. As Christmas approaches and we reflect on the past year, let us all be mindful of those who have impacted our lives for the better. Let us be reminded that God works in all of us, and the positive difference we can make in others. I am personally thankful for each of you and look forward to all that we can accomplish in the New Year. Happy New Year.Hang in there and move forward. Work together and have a better year. We here in the Hudson Valley of NY have had a bad year also. We have cleaned up and moved forward. To you and your crew good health and good fortunes.